After finishing the Race Across America in 2015 and the Tour Divide in 2016, it didn’t take long to settle on the TransAm Bike Race as the main goal for 2017. I finished the TransAm last month. As far as I know, nobody else has completed the triple. So I thought it would be interesting to sit down and think about how these three legendary races stack up against each other. Unsurprisingly, RAAM was the highest average daily mileage (258 miles per day) and the Tour Divide the lowest (145 miles per day). For TransAm I averaged 217 miles. These numbers are not hard to explain. Here are the bikes. RAAM is a supported race and I had a wonderful crew working in shifts to do everything except pedal the bike. Both the Tour Divide and the TransAm are unsupported. The Tour Divide is remote and you need to be much more self-sufficient than on the TransAm, which goes through a lot of population centers. And even though I rode a fully rigid mountain bike, my bike must have been at least 10 lbs heavier for the Divide. Navigation is another factor. Even with a GPS, navigation on the Divide can be tricky, and mistakes can cost you a lot of extra uphill. I went wrong a few times on the TransAm, but route-finding was generally pretty straightforward. And on RAAM all I had to do was follow instructions. The crew made no mistakes. 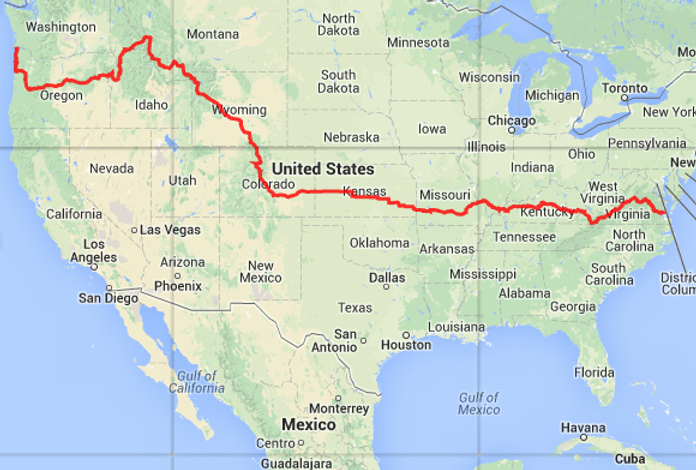 At the risk of pointing out the obvious, the TransAm really is long, at just under 4,300 miles. Riding the length of RAAM only takes you to the Mississippi, with Illinois, Kentucky, and Virginia still left to go. And it has some brutally steep climbs, particularly in eastern Kentucky and then up to the Blue Ridge Parkway. But there’s nothing on the TransAm comparable to the really long climbs on RAAM (e.g. from Congress to Jerome, and over Wolf Creek Pass). And when it comes to long lonely stretches on brutal terrain the Tour Divide is in a league of its own (think the 100 miles push from Pie Town to Silver City). What really marks RAAM out is the desert – the low desert in California and Western Arizona, and then the high desert further east in Arizona and in Utah. There’s nothing on either of the other routes that comes close to making the physical and psychological demands of crossing those hundreds of miles of desert. Completely brutal,and, because the desert comes at the beginning, everyone hits the mountains in a very depleted state. Crossing the Great Basin in the Tour Divide certainly has its moments, though, particularly the long stretch after Wamsutter. Memorable scenery? It is hard to beat riding through Yellowstone on the TransAm at 3 am, watching the steam from the geysers in the moonlight. I suspect that most TransAm racers go through in the daylight with a lot more traffic, though. In terms of iconic sights across the country, RAAM wins hands down, with a full sweep of unforgettable sights, from the Imperial Sand Dunes through Monument Valley to Gettysburg. But the Tour Divide certainly wins for mountain views and remoteness. Risk-wise, traffic is the main danger, of course. TransAm racers are not dealing with the extreme fatigue and sleep deprivation characteristic of RAAM, but then RAAM racers should always be closely followed by their crew. Long stretches of the TransAm are on dangerous roads with no shoulder and heavy traffic. I felt that more attention to safety awareness was really needed on the TransAm. The risks on the Tour Divide are primarily due to the remoteness. Bears are what people think about most. Statistically, though, I was more concerned about crashing a long way from anywhere than about running into a hostile bear (although I carried bear spray easily accessible one-handed while riding). But what you really want to know is: which is harder? Well, here is my opinion. In terms of physical and athletic demands, RAAM is out there in a class of its own. With proper training and proper preparation any reasonably fit and motivated cyclist should be able to complete the TransAm in a respectable time. Adding more bike-handling, bike maintenance, and survival skills to the training should bring a decent Tour Divide finish within reach. But completing RAAM within the time limits for an official finisher is a completely different level of achievement, out of reach for all but a few. To appreciate this, just read the athletic biographies of the folks who DNF each year, and look at how they have trained. It’s a popular misconception that supported bike racing is easier. The reality is that being supported makes the racing incomparably harder. No sit down meals, no time off the bike in gas stations, 90 minutes or so sleep per night. Having support makes all that possible – and the time constraints in RAAM pretty much necessitate continual movement. The Tour Divide presents unique challenges, though, and tests much more than just athletic ability. So, to manage a fast time you need to have an unusually wide range of skills, on and off the bike. You need to be able to keep yourself and your bike in good health, and to fix problems as they arise. You need to be able to ride smoothly and quickly on everything from singletrack to washboard. And you need to be able to camp efficiently and plan well to make good use of the limited refuelling opportunities. My feelings about the TransAm are more ambiguous. On the one hand it is by far the longest of the three, which presents its own set of demands. But on the other it is not always clear what sort of a race it is. It is possible to do it relying heavily on hotels and bike shops (and many people sleep in post offices, although this is of course illegal and in my view anti-social). I personally prefer to sleep out and so I carried a sleeping bag. I did spend three nights in hotels, one in a post office (I still feel bad about this), and two in toilets. The rest of the time I slept by the side of the road. I also remembered 48 hours of continuous heavy rain at the end of RAAM in 2015 and so I had enough clothes on the TransAm to deal with a multi-day storm. But it would certainly possible to go much lighter (raising the risk of a DNF in bad conditions, of course). So, having said all that, I will most likely go back to RAAM and to the Tour Divide in due course. The traffic puts me off another run at the TransAm, however. That’s a shame, but there it is. Once, out on a training ride in the Texas Hill Country, I ran into someone who had raced team RAAM. I told him I was heading off to do solo RAAM and he said: “Safety first; finish second; result third.” Best advice I’ve ever had.